In response to various community initiatives; including LGBTQI+ Suicide Prevention consultation efforts, state and national legislation and policy, Council health and well-being objectives and current community and media activities relating to the LGBTQI+ community in Gippsland, Gippsland Ranges Roller Derby are pleased to auspice the inaugural Gippsland Pride Initiative in 2019. ​Where the national average participation rate of LGBTQI+ individuals in sport is 2%, Gippsland Ranges Roller Derby club (with ~25% of our members identifying as LGBTQI+), are determined to be a part of a positive and necessary change in the conversation and the living experience for the Queer community in our region. ​So as part of our #FutureOfDerby Project Gippsland Pride Initiative are realising our potential as a sporting club and active member of the Gippsland community. Gippsland Pride Initiative aim to bring about a new initiative to provide visibility, engagement, awareness and celebration to LGBTQI+ Gippslanders. Create a space of safety, celebration and socialisation independent of the sporting field. The First Roller Derby Pride Cup in Australia! This entry was posted in News on March 25, 2019 by Nicole Osbourne. 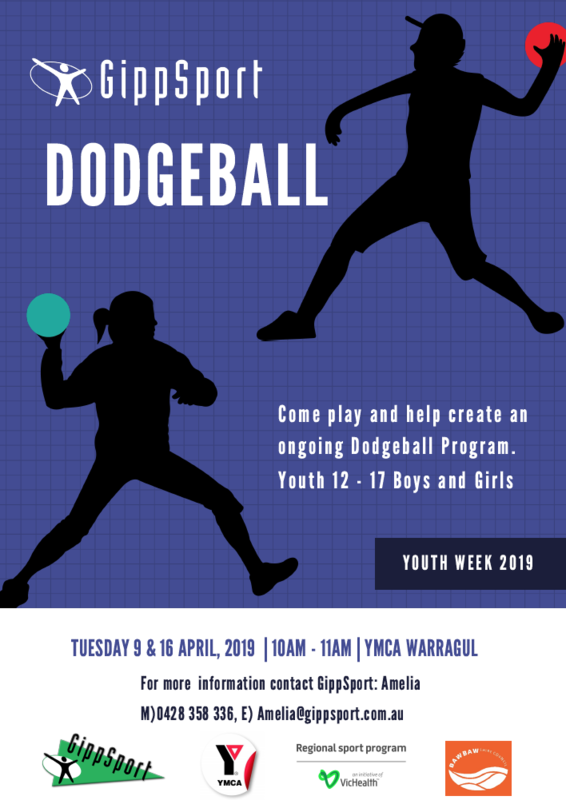 GippSport are partnering with Baw Baw Shire Council and Warragul YMCA Centre to deliver sporting activities during youth week 2019. 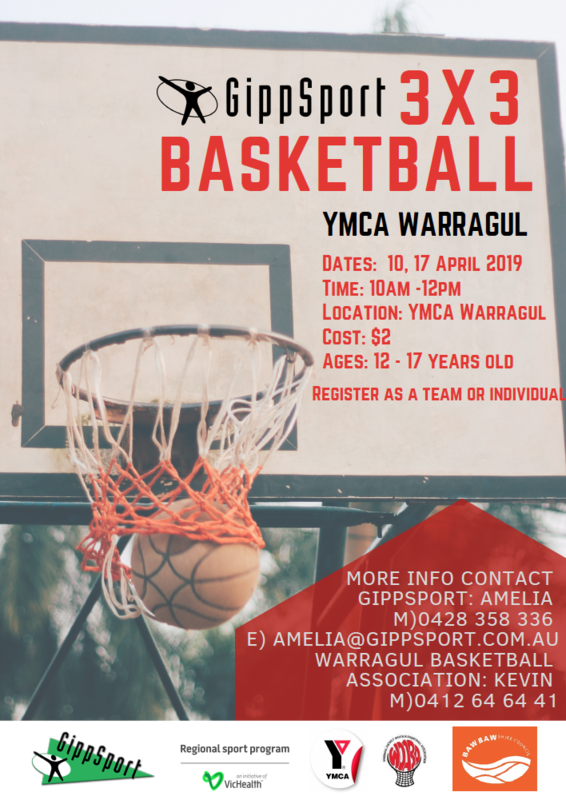 With the support of Warragul Basketball Association we will be hosting a 3 x 3 basketball tournament on April 10 & 17 from 10am onwards. Programs are for youth aged 12 – 17 and cater for all levels of experience. Active April is happening again and we’re encouraging all Gippsland clubs to get involved in the State Government’s active lifestyles campaign. The Premier’s Active April is part of the Victorian Government’s commitment to promoting healthy and active lifestyles by encouraging all Victorians to do 30 minutes of physical activity a day. 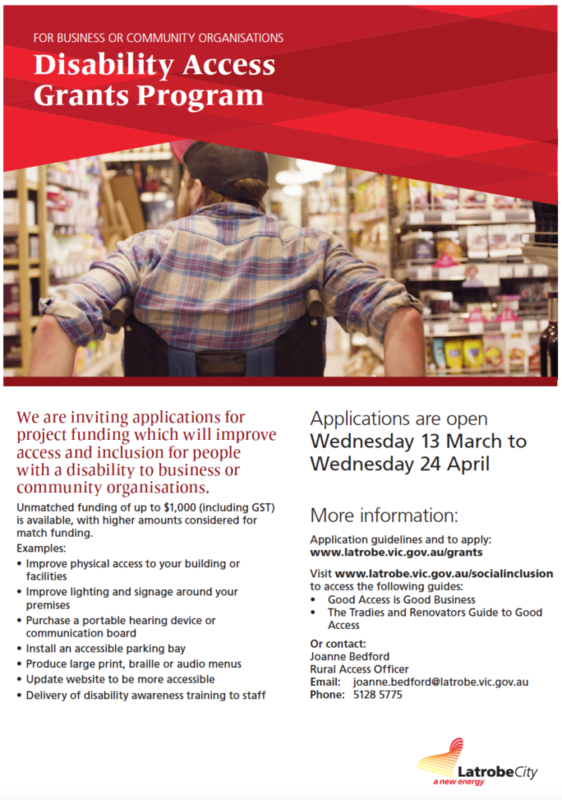 Now in its eleventh year, the initiative continues to help Victorians increase their physical activity. Over 120,000 people participated in activities run as part of Active April last year. Active April is an excellent way for clubs to engage with their local community by offering an activity during April. My Local allows clubs to list their facility and events for the public to search and find what is happening near them. Your activity can be something that your club runs regularly, or, you can offer something unique just for the month. Clubs can register their event by clicking here. A range of marketing materials has been created to help to promote Active April at early learning centres, schools, workplaces, clubs and in the wider community. This includes information you can use in newsletters, emails, on your website and in posters. To access this information, please click here. Campaigns like these are an excellent way for clubs to jump onboard a participation initiative that is communicated to consumers directly and the opportunity to tap into the various new markets of all age groups. This entry was posted in News on March 14, 2019 by Nicole Osbourne. Spartan Kids Race – Fun and unique training opportunity! Looking for a unique training experience over the school holidays for your junior team? Spartan Australia is bringing the world’s best kids’ obstacle course race to the Latrobe Valley these April school holidays, and would love to have your club or team involved. Spartan’s Kids Latrobe Valley will be held April 15-16 at Civic Park, Drouin and waves will run every 45 minutes from 9am until 2:45pm on both days. The Spartan kids’ course will feature 2km of pure muddy joy suitable for children of all fitness levels. Junior Spartans between the ages of 3-13 are encouraged to come along and conquer specifically designed Spartan obstacles while having a whole heap of muddy fun in a non-competitive, safe, and supportive environment. We’re encouraging kids from across Gippsland and as far and wide as Melbourne’s eastern suburbs, to join us for the biggest event of school holidays, and to find out what it means to race like a junior Spartan! Our kids’ courses provide the perfect strength and agility training to help kids learn new teamwork skills they can take back to their own sport. So, bring your team down to our Spartan Kids’ race and let them train their minds and bodies on our specially designed kids’ obstacle course! Kids will receive all sorts of freebies; like a badass 2019 Spartan Kids’ Medal, a Spartan Kids’ T-shirt, and a Spartan Kids’ headband! Parents are welcome to run on course with their kids, free of charge! Registrations for Spartan Kids Latrobe Valley are now open from $25, and we’ve got epic team discounts available! If you’ve got a big group of kids, contact info@spartanrace.com.au to discuss large-team discounts. 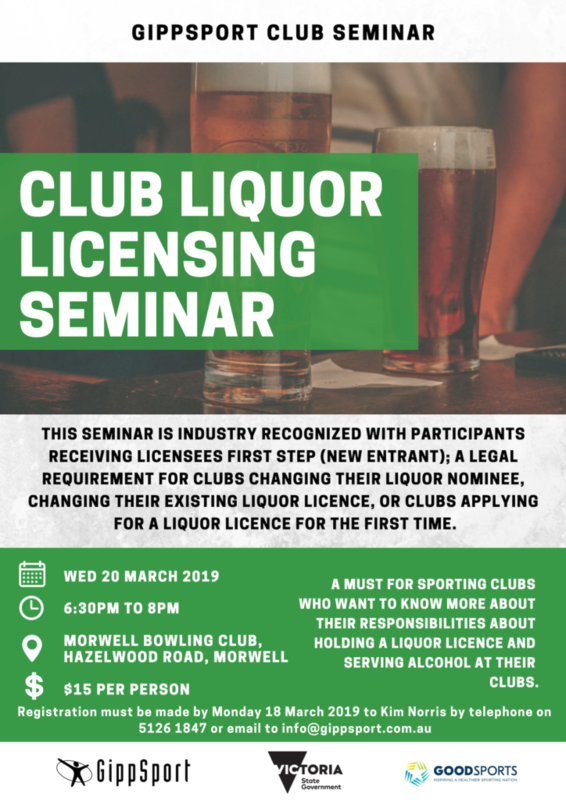 GippSport will be hosting a Club Liquor Licensing Seminar for members of Community Sporting Clubs. Club seminar training can be undertaken by club committee members in place of new entrant training in order to meet training requirements for restricted club licences and renewable limited club licences. This entry was posted in News on March 4, 2019 by Nicole Osbourne.